Set oven control to broil. Line cookie sheet with foil; place chiles on foil. Broil chiles 3 to 4 inches from heat about 5 minutes on each side or until skin blackens and blisters. 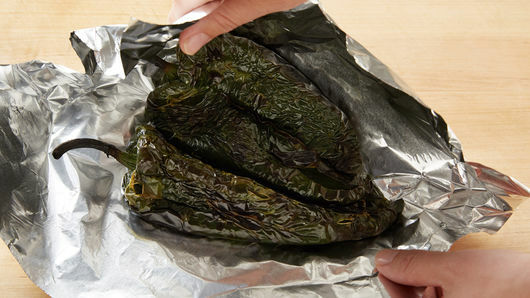 Wrap blackened chiles in foil. Let stand 10 minutes. Turn off broiler; heat oven to 425°F. Move oven rack to middle position. Spray large cookie sheet with cooking spray. Meanwhile, in 10-inch nonstick skillet, cook bacon over medium-high heat 4 to 6 minutes, stirring frequently, until crisp. Remove bacon from skillet. Place on paper towel-lined plate; reserve drippings in skillet. 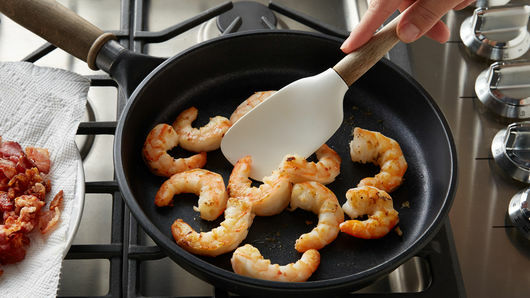 Add shrimp to drippings in skillet; sprinkle with salt and pepper. Cook 1 to 2 minutes on each side or until shrimp just begin to turn pink. Place shrimp on paper towel-lined plate. Set aside. Unroll dough onto cookie sheet. Starting at center, press dough into 15x10-inch rectangle. Bake 6 to 8 minutes or until light golden brown. Meanwhile, gently rub chiles with paper towel to remove as much skin as possible. Cut top from each chile; remove seeds. Cut chiles into 1/4 inch strips. Spread crema over crust to within 1/2-inch of edges. 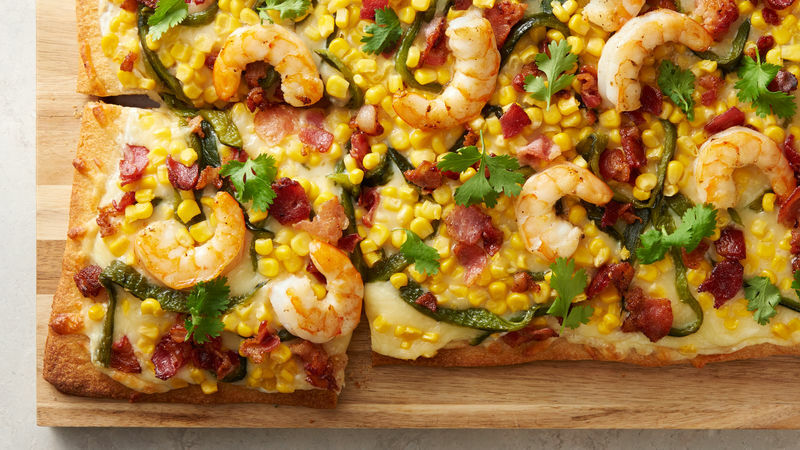 Top with cheese, roasted chiles, corn, bacon and shrimp. Bake 9 to 11 minutes or until golden brown and shrimp is cooked through. Garnish with cilantro leaves. 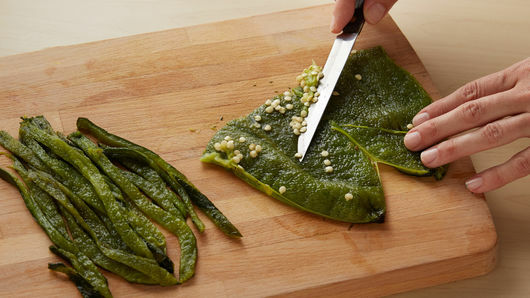 To roast the poblano chiles over a gas burner, carefully roast them for about two minutes on each side, rotating with tongs, until chiles blacken and blister. My favorite food growing up was my mom’s recipe for chiles rellenos. They were always so cheesy and delicious. My mom would stuff them with cheese, but on special occasions she would add shrimp, and she always served them on a bed of rice with corn. Each time I eat chiles rellenos, they remind me of my birthdays or the days I’d come home from college. Even now as an adult she still makes them for me. Growing up, my mom would cook every night. No matter how busy life got, she always made sure our family came together for dinner. I believe that’s why I love to cook so much. Food brought our family together for dinner. My mom also taught me how to cook. One of the first things my mom taught me how to make was “rajas con crema,” which is basically poblano peppers in a Mexican cream sauce with corn. This recipe that I created was inspired by both—my favorite food growing up and one of the first things I learned how to cook. 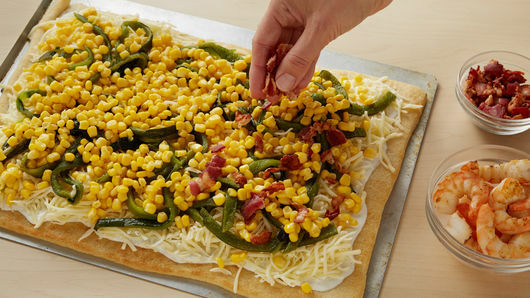 My Poblano Shrimp Flatbread really tastes like a mixture of cheesy chiles rellenos and creamy rajas con crema. It’s the perfect mashup.